Home > Uniforms, Armour & Medals. Newly Printed Book: Written by J. Anthony Carter and published by the Tharston Press. As many collectors will know J. ANTHONY CARTER, renowned for his GERMAN BAYONET BOOK SERIES in Four Volumes and many other works, died in 2002. Anthony was one of Christian Cranmer s (IMA founder) very closest friends from virtually their boarding school years in England and was in fact the Godfather to Christian s own son Alexander who now runs IMA. Upon Anthony's death, his works both published and in progress became Alexander's and hidden away we discovered a partially completed manuscript covering the traditional "Tommy Helmet". With the great help and expert understanding of John Walter, himself a noted Author, this small work has been completed and is now available in a hard bound, wipe clean color cover edition 9.5" x 6.5" of 80 pages outlining the development, manufacture and issue of these very collectable helmets. Including original photographs and color illustrations this is a useful work every helmet collector should own. Magnificent military hats from Asia, America, Europe, South America etc for each week of the 2003 Calander year. An excellent reference for the Military Hat Collector. Nazi Buckles: Psychology and the Fighting Spirit. Cowdery. Nazi Buckles: Psychology and The Fighting Spirit, by Ray Cowdery. Excellent book on the German buckles of WWII, how they were made, non-military buckles, Nazi Regalia in Russia, divisions of the German Reich, the RzM and it's buckle manufacturers trademarks and current German buckle manufacturers. Excellent glossary, abbreviations, runic alphabet, bibliography and military museums. Numerous colour and black and white photos. Superb book for the buckle collector. A renowned nineteenth-century cultural historian and specialist on the Middle Ages, J. H. Hefner-Alteneck spent much of his life observing the influence of art on many aspects of human life, including weaponry. His illustrations for this handsome archive — drawn with incredible exactitude — depict a wide array of medieval weapons and armor dating from the early ninth century to the mid-1700s. Adapted primarily from decorative ornamentation on burial monuments and manuscripts, hundreds of finely executed images depict authentic shields, swords, crossbows, helmets, and highly ornate suits of body armor for knights and their steeds. Newly translated descriptive notes, extracted from the original German text, identify the subjects. First published more than 100 years ago, this meticulously rendered study remains an invaluable source of permission-free illustrations for artists and designers and an indispensable reference for scholars, collectors, and hobbyists. The Denison smock was a coverall jacket issued to Special Operations Executive (SOE) agents, the Parachute Regiment, the Glider Pilot Regiment, Air Landing Regiments, Air Observation Post Squadrons, and other Commonwealth airborne units, to wear over their Battle Dress uniform during the Second World War. Data for the badges includes: Description, motto, reason for design, original unit badge, close copy, status, crown bound by, monarch, inspector, remarks. 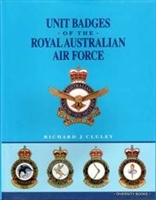 Contents include: Introduction, Acks., General Badge of the RAAF, Chapters 1-20, Appendices I-II, Glossary, Index. German Military Ribbon Bars: 1914-1957. Hayden. German Military Ribbon Bars fills an obvious gap in reference works on German awards and medals. Drawing on many resources from around the world, his own collection, and with many unpublished photographs from 1914-1970, author Mark Hayden examines German ribbon bars from World War I, the Inter-War years, World War II and finally those worn by veterans in the reconstituted Bundeswehr of 1957. The wide variety of construction, styles, and combinations are discussed in detail, along with information on values, availability, and reproductions. This book is sure to be a welcome addition to the libraries of militaria collectors and students of military history alike. German Luftwaffe Flight Headgear of World War II: A Collector's Guide. Skotte. Covers in detail the development of German WWII flight headgear. Many B&W photographs of Leather helmets, steel helmets, goggles and oxygen masks as used by the German Luftwaffe. Lots of specifications and detail on every piece. Detailed, scholarly survey of defensive armour used in the Middle East and Asia — from the scale armour of ancient Egypt to Japanese "modern" armour of the 19th century. Over 300 line illustrations and over 100 photos depict armour of Persia, Turkey, India, China, Ceylon, the Philippines, Korea, Tibet, and other regions. A misericorde is a medieval poniard or dagger made for one purpose — to give the coup de grace or killing stroke. It was a beautiful, deadly instrument with a graphic mission; its very shape and cut graphically manifest its age and those who used it. Weapons throughout history chronicle ages, styles, and approaches to life and death; for artists, a weapons archive is a pictorial arsenal of powerful imagery. Here is such an arsenal: over 1,400 copyright-free illustrations of weapons and armor epitomizing the warlike times and peoples of this planet. Twenty-two categories of offensive and defensive arms and armor include battle-axes, bows and arrows, cannons, catapults, clubs, daggers, handguns, machine guns, powder horns, rifles, spears, swords, tanks, suits of armor, helmets, shields, and other means of combat. These copyright-free black-and-white illustrations (with a few half-tones) have been culled from almost 50 separate sources, ranging from books of ancient armor to scarce foreign periodicals and engravings. Along with the arms themselves are those who wield them — soldiers, warriors, knights, horsemen, hunters, jousters, duelists, arms manufacturers, aborigines, centurions, dragoons, musketeers, samurai, crusaders, in full period regalia. One plate identifies all the parts of a 17th-century suit of armor — visor, gorget, tassets, epauliere, cuisse, chain mail, gauntlet, etc. ; many show details of intricate Renaissance and modern carving on pommels, blades, rifle butts, and boomerangs. Some remarkable devices include the Chinese Tartar 2-handed sword, Malay creese, Tormentum, Maxim gun, 16th-century Italian cross-bow, Soviet tank from World War II, Indian damascened cuirass, bamboo lance, halberd, and the scimitar. Unusual strokes may be visually delivered by such instruments as the Patagonian bola, a cane sword, the Zarabatana native blow gun, and the infamous "holy water sprinkler." Artists and designers will not find these rare emblems of warfare gathered together elsewhere in such a clearly printed format, so quickly accessible; historians of art, industry, and war as well as weapons fanciers will marvel at all the picturesque means here depicted of giving the coup de grace. With the way the battlefield has evolved over the last ten years, the soldier's equipment has had to evolve accordingly. Although the media often shows the US Army Boys right in the heart of the fighting in Afghanistan, and up until recently in Iraq, their equipment, material, and weapons have never been shown in detail. This book has now done this, drawing up an exhaustive list of the equipment used by the US Army's infantryman (but also the helicopter pilots and the armoured vehicle drivers) - from the boots to the wrist computer, via the assault rifle and the winter uniform - and the programs intended to make the soldier even quicker, even more effective and better protected. The close-range engagement of tanks became extremely important mainly because of the Soviet T-34 and KV-I tanks, which for a long time were superior to all German tanks and anti-tank guns. Frequently employed in small groups of three to five tanks to support the infantry, these Russian tanks could often be put out of action with close-range weapons. This book provides a concise account of Tank Destruction Badge, and the close-range combating of tanks. In addition to a description of the special badge and the most commonly used weapons, it includes operational accounts by recipients of the badge. History of the 24. Waffen-Gebirgs Division. Michaelis. Take a detailed look into the brutal anti-partisan warfare in Yugoslavia during the Second World War. The SS war against the partisans, dubbed Bandenkampf (literally "fight against bandits") at the time, differed greatly from the conventional war at the front. The 24. Waffen-Gebirgs [Karstjäger]-Division der SS anti-partisan unit was mostly comprised of ethnic Germans from Romania and operated in the Karst border area of Austria, Yugoslavia, and Italy from 1943 to 1945. This is not only a history of this SS division—including details of formation, training, commanders, and operations—but also an examination of the German Anti-Partisan War Badge in Gold and its recipients from the unit. Very rare examples of actual badges, award documents and soldbuchs, and never before seen war era images are presented. This excellently illustrated volume provides factual accounts of events ranging from the earliest invasions of the subcontinent in 200 b.c. to the First Burmese War in 1824. Also includes detailed information on Arabian and Persian arms and Japanese armor. Illustrations and notes describe helmets, daggers, sabers, and other weapons. 350 halftones and line illustrations. All aspects of German panzer troop uniforms in over 200 photos, many in colour. German Sniper Badge 1944-1945. Michaelis. Hitler created the Sniper Badge on August 20, 1944, to impel soldiers to train and be used as snipers. Thus the strategic importance of single combat was stressed in highly stylized propaganda. Since the soldiers themselves to a special extent were in sight of the enemy troops, unlike the members of other service arms, experienced the death of their enemies directly, the numbers of volunteers did not reach the planned extent. In this concise history, this badge, as well as the actions of German snipers, is examined and includes colour images of badges, weapons, awards, soldbuchs, and war era photos. Allied Special Forces Insignia. Taylor. A very well-researched and accurate account of the largely "forgotten heroes" of 1 Group, RAF Bomber Command in the Second World War. The narrative moves at a lively pace which combines appropriate levels of detail regarding operations, aircraft, bases and incidents, in the wider context of the unfolding Second World War, set against a backdrop of policy failings and evolving successes, and more than anything, the sheer determination and bravery of young British, Commonwealth and Polish aircrews who never hesitated in giving everything to the cause of ultimate victory, regardless of the personal cost. An over-due tribute to a major contributing factor towards the ending of the Second World War in Europe, which well highlights the superiority of the RAF equipment made available and tactics adopted as the war developed, the humanity and professionalism of the participants, the amazing odds against which they were flung, and the conveyance of a real feeling of being there re-living these exploits. With the exception of the royal marines, who adopted light infantry rank insignia from their earliest days, the Royal Navy was slow to introduce distinguishing rate badges for those serving on the 'lower deck'. Even when they were introduced, in 1853, the corresponding introduction of a uniform was still four years away. As for officers, the design and arrangement of buttons also played a part in distinguishing one rating from another. In a unique compilation, the insignia worn since the mid-19th century by Royal Naval ratings, Royal Marines, queen Alexandra's Royal Naval Nursing Service, the Women's Royal Naval Service, the Merchant Navy, Auxiliaries, Volunteers, youth, and other maritime organisations, are brought together in a single volume. European Weapons and Armour: From the Renaissance to the Industrial Revolution. Oakeshott. Rank and Rate: Royal Navy Officers' Insignia Since 1856. Coleman. For over a century and a half, since the Uniform Regulations of 1856 were introduced, identification of rank among officers in the Royal Navy, its branches and its reserves has not been restricted to a single, or even small number, of insignia. Rank may be seen on jacket cuffs, on shoulder badges, on shoulder boards and on epaulettes. It may be seen on swords and buttons, and in the manner in which buttons are worn. Cap peaks indicate rank, as do collars, cocked hat ornaments and cuff slashes. Rank insignia varies just as much between officers of similar rank. Cap badges and variants of gold lace stripes divide Executive from Civil branches, and from the Royal Navy and its reserves. Civil branches were further divided, and some remain so to this day, by the addition of color between the gold lace stripes. For the first time the complete range of Royal Navy Officers' insignia may be seen and studied in a single, comprehensive guide. The badges, buttons, stripes, wings and stars are catalogued separately in order of rank and date of introduction. Where possible, actual examples are used, and where not, an accurate as possible reproduction is offered. In addition, original photographs show the insignia being worn over the past 150 years. This study is organized into chapters each focusing on an individual area of body protection, charting the evolution of each piece over time, from helmets and chest protection to arm guards, gauntlets, leg guards, and sabatons. It also encompasses the use of weaponry and its evolution, including protection for horses. With the aid of photographs and illustrations, it looks at how fashions, as well as its protective qualities, influenced the style of armour. Valuable information has been acquired through the study of effigies over a number of years, and using these existing artifacts, supplemented by the author's meticulous illustrations and practical knowledge of armour construction, it has been possible to reconstruct the design and appearance of a wide range of armour. Uniforms of the German Soldiers: An Illustrated History from 1870 - end of WW 1. De Quesada. Through periods of glory, defeat and renaissance, the German Army uniform has evolved. Prussianistic and Germanic traditions have remained strong throughout the uniform's history, and can still be found in the insignia and equipment of the present-day soldier. In 1870 the uniforms worn by Imperial German soldiers varied between the different principalities. The spiked helmet (pickelhaube) was first adopted by Prussia in 1842, but it was later used throughout Germany. The pickelhaube was made out of leather, with metal reinforcement and a metal spike. It went through a number of modifications, such as the introduction of a round visor and the replacement of the rear spine. Within the colonies, there was even greater variation in uniform and equipment. In German East Africa, the soldiers wore white service uniforms with white tropical helmets and the national cockade of black, white and red. The East Asia Brigade wore a field grey jacket with four front pockets lined with leather, designed for carrying cartridges. 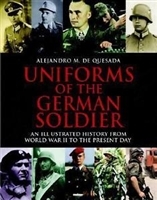 Uniforms of the German Soldier has more than thirty colour photographs and more than 300 black-and-white photographs, giving the reader an unparalleled analysis. Each photograph is accompanied with a detailed caption, explaining interesting aspects of the soldier's uniform, insignia and equipment. 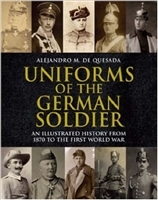 Uniforms of the German Soldiers: An Illustrated History from WW 11 to the present day. De Quesada. A photo-history of German Army uniforms, regalia and equipment. 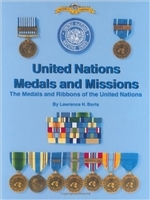 United Nations Medals and Missions. Borts. The peacekeeping operations of the United Nations have grown in number and importance in recent years, producing a thicket of bewildering acronyms (UNIKOM and UNIPOM, UNOMUR and UNAMIR),and for participants a corresponding number of awards, which are often confusingly similar in appearance. For the first time this is all sorted out, in this well-produced guide. The book features excellent color illustrations of the medals, ribbons, and insignia, with information on the historical context, mandate (mission), participant countries and strengths, fatalities incurred, and number of medals issued. There is also a chronology, a world map of operations, a splendid section on Korean War medals and variants, background essays, bibliography, index, and more, providing comprehensive coverage of this relatively neglected area. Borts' admirable work will likely be the standard on the subject for many years to come, and will be of particular interest to students of contemporary military affairs as well as collectors. Royal Navy Uniforms 1930-1945. Brayley. Royal Navy Uniforms 1930-1945 uses over 400 illustrations - both period images and new colour photographs of original items - to show the clothing of both Officers and Ratings in World War II and during the years leading up to it, when Naval uniforms underwent significant modernisation. The illustrations are supported by detailed text describing the development and use of Naval clothing of the time. Its contents include Officers' clothing and effects; Class 1 and III Ratings' clothing and effects; seamens' clothing and effects; battledress and tropical clothing; miscellaneous clothing, personal effects and substantive and non-substantive insignia. This is the first book to offer a detailed study of Royal Navy clothing in the 1930s and World War II and will be a vital resource for collectors, historians and enthusiasts. All of the major uniform types are superbly illustrated with 470 colour and black & white studio images and period photographs.